Ride sharing app and car sharing app | How does it work? Here are some generic tips (and some specific to the Quick Ride platform) that we thought may help to increase your chances of finding shared rides, and also get rated favourably by your co-travellers. Post your ride as early as possible - this increases chances of others seeing you when they search for options. It is good to answer to queries (chat) from potential co-travellers, or join requests or invites within 15 mins. If you have noticed but are too busy, you may try to drop a very short reply as to when you can revert back (in how much time). Responsiveness is very conducive to sharing. For repeated rides, you can use the "Repeat Regular"/"Regular Ride" setup option; this can be cancelled/rescheduled each day if needed. While taking a ride from someone - avoid offering cash, or incentives to the other party, with a request for a different (preferred) drop-off location; the person offering the ride has the right to refuse as it may be out of the agreed norms for sharing on the Quick Ride platform. Do not hesitate to use the SOS button in the Quick Ride app in case of an emergency (useful to have your Emergency Contact details in your profile set-up beforehand) , or call Quick Ride support line for help. At any time, your safety is of primary importance to us at Quick Ride. If you do not have enough information to make an informed choice, or you do not feel comfortable to join another person – we encourage you to use other options. Given the various benefits of Quick Ride – fast, comfortable, less expensive, eco-friendly, and social – we hope you can use Quick Ride as your primary choice for daily travel, and other modes can be used as backup options. Also, the more people you help to bring onboard the platform – the more options you will get to see. By using the "Share and Earn" option in the menu, you can directly refer friends and get rewarded by earning points! On-time behaviour helps to contribute to a better ride-sharing experience. Inform other participants in advance if unable to make it on time and unjoin yourself from the ride. No Cash and Direct PayTm transactions are allowed for Quick Rides. Violation of the terms may get your account suspended with penalty. Conversation should be limited to ride-sharing discussions. Personal discussions are strictly prohibited. Use Quick Ride chat only for communicating with ride participants. If any changes on the plan please rise proactively and inform co-riders. Quick Ride is not only about sharing rides & fuel costs. It’s also about sharing short conversations to build a rapport with co-riders & grow your professional network. Avoid talking loudly on phone. Ride sharing is also about sharing conversation with ride participants. In general, show respect for the other person’s presence & privacy within the same vehicle. Probability of sharing a ride is higher when scheduled in advance. Get more ride options by creating recurring rides. Know the matching pick-up, drop points and plan your last mile journey accordingly. Don’t insist rider to deviate from the route just to drop you home. Maintain the cleanliness of the car to a reasonable extent, while sharing rides. Offer to clean up (or pay for clean up) in case of any accidential spillage, stains, etc., as a better act. Remember this is carpool & not a Taxi. Rider is a sensible professional who wants to help by sharing empty seats. Please return the favour by handling the car smoothly such as closing the doors. Deviation/ additional stops (if any) on the planned route should be informed beforehand to co-riders. Ride participant’s safety lies in your hand. Avoid using mobile phone while driving, avoid rash-driving, follow speed limits, and traffic rules. 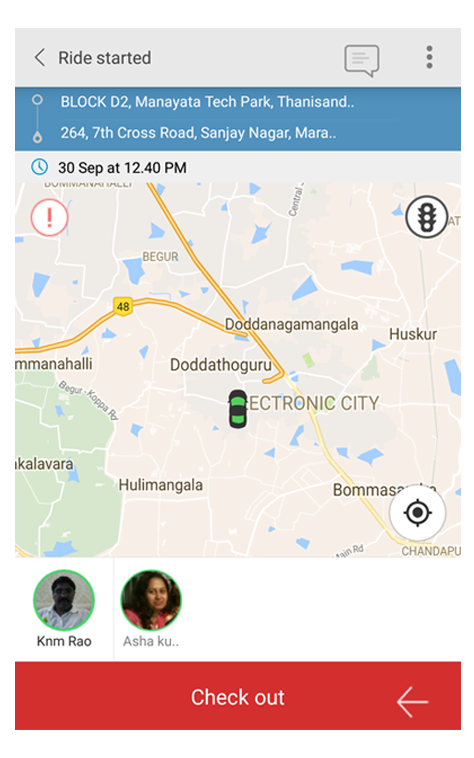 Quick Ride is a car pooling and bike pooling application which facilitates ride sharing by giving a choice to user either to offer or find rides. What is carpooling/bike pooling/ride sharing? Carpooling/Bike-pooling/Ride-Sharing refers to the sharing of empty seats in a vehicle. People driving from one point to another can share the empty seats with others who would like to travel on the same route. Using Quick Ride does not bring any extra vehicle on road. Instead, it helps in filling up the seats through ride sharings in already commuting vehicles that go empty. How is it different than other carpooling cab services? Quick Ride is not a cab service application. Riders in here are working professionals who commute to and fro in their vehicle. Since they are the only ones travelling in their vehicle, it usually remains empty. They want to cut the cost of travel by offering rides to other needy passengers. Encourage adding new vehicles on road Does not encourage adding new vehicles on road. Our main aim is to efficiently utilize the "empty" seats of vehicles that are already on the roads Reduce the traffic congestions and total travel time for all. Using Quick Ride, the user can invite people to join ride or accept invitations from other members. After completing the ride, the system allows user to transact through points with fixed per kilometre charges. Quick Ride clearly differentiates the users with Verified status, after validating the corporate email id. Users can configure their social network profiles, so other users can make informed decisions before connecting. How does a user benefit from Quick Ride? Quick Ride is a platform that lets corporate employees travelling on the same route share rides, share commuting costs, reduce traffic and pollution, all the same time. Rider gets to share your petrol cost and network with corporate employees. Bus rides are cheap. Why should one use Quick Ride instead of travelling by bus? Surprising as it may sound, rides using our app is cheaper or almost equal to the bus fares. In addition to the cost benefit, our rides are comfortable and less time consuming compared to that of bus rides. It’s quite simple! Sign Up using your phone number after downloading the app. After verifying your phone number, enter your profile details too complete registration. You are all set to post your first ride and enjoy our service. Can I register using my Facebook account? Yes, you can register using Facebook account. How is the verification done? After entering the profile details, including the corporate email ID, email verification is sent to the corporate ID. You can either enter the 4 digit code sent to the email to verify account or click on the link given in the mail which automatically verifies the account. Before offering rides, you have to give the details of your vehicle which include the registration number and the type. After saving those details, you can offer a ride by entering to and from location details. If there are any ride seekers looking for rides in your route, you will get the notification asking them to invite for a ride. How do I seek a ride? Once your account verification is complete, you can find a ride by entering to and from location details. 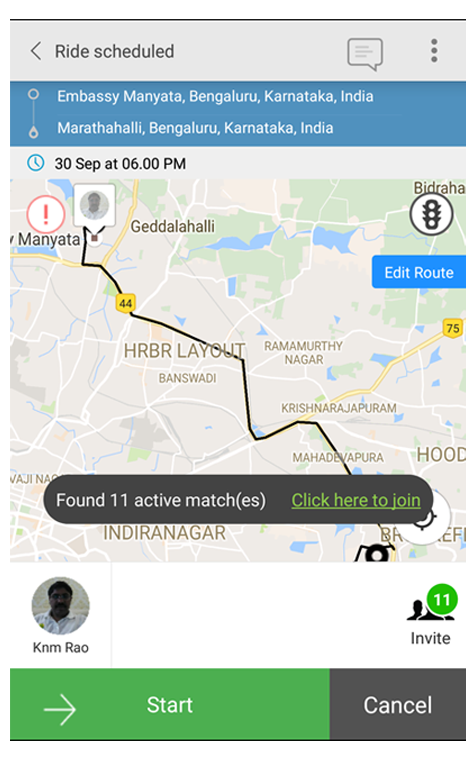 After posting the ride, you will get matches with riders travelling in the same route. The start and end point of rider, route match %, number of seats available will be mentioned. You can send an invite to ride with them. What is route match %? When a ride seeker finds a ride by entering the location, he/she might get matches with riders who will start the ride much before the pickup location of ride seeker. Route match % shows the ride seeker what percentage of riders route is matching his/her route and vice versa. User who wants to share the empty seats of his/her vehicle with others who want a vehicle to commute is called a rider. Who is a ride seeker? 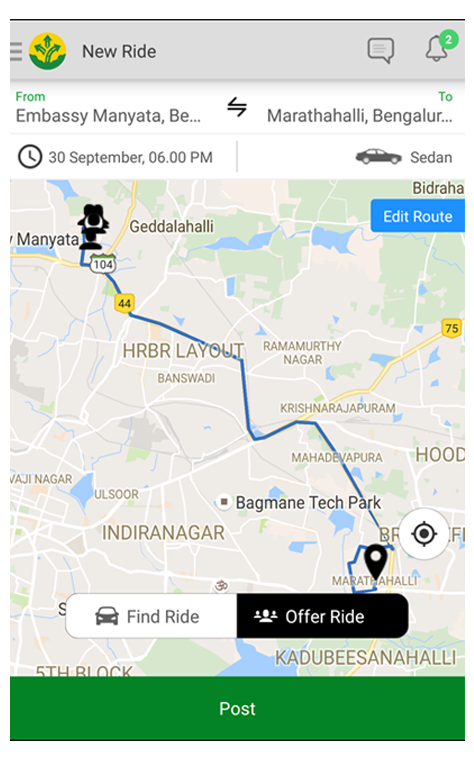 User who wants to join the already commuting empty vehicle of a person without adding another vehicle on road is called a ride seeker. How do I invite someone to ride with me? 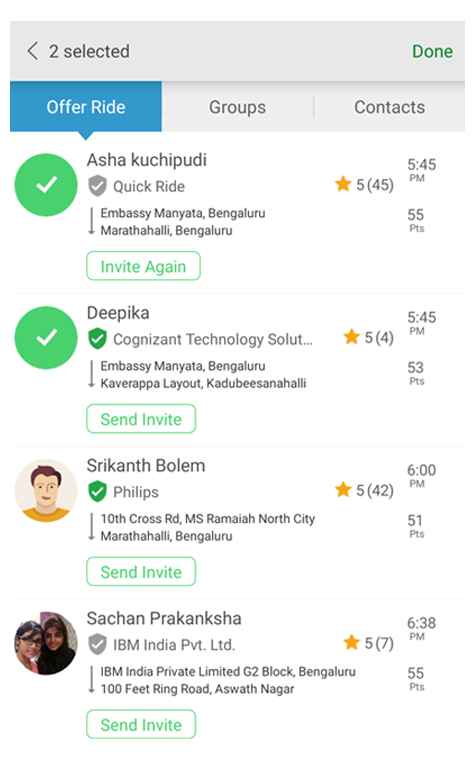 After offering a ride, you get all possible matches of ride seekers who want to travel in the same route(partially or completely) at the same time mentioned by you. You can invite the ride and the ride seeker might choose to accept or reject it. I leave for office at different times every day. Will this app work for me? Surely! Why not? This app has been designed keeping in mind today’s corporate lifestyle. It works in real time considering the options at that particular instant. You can offer a ride whenever you want to travel and also change the time if required. The system will show all possible ride seekers travelling from or on the way to your destination at the time you have mentioned. You can choose your co-rider accordingly. I was supposed to drive two people home today, but I have an unplanned meeting to attend. What should I do? Such situations are quite common and we understand, so do your co-riders. In such situations, you can cancel the ride, at the earliest. Quick ride has a dynamic system and the ride seekers will automatically be matched with other riders available. Please cancel the ride at least an hour prior to the scheduled ride. How can I coordinate the pickup point with the ride seeker? The live tracking page is displayed on the map. It shows all the ride participants and their exact locations at any given point of time. You can use group chat option to chat with all the co-riders and coordinate the location. You can also directly call them on their phone number. Can I set the schedule for whole week in advance? Sure you can. Select the days and time in which you would want to offer ride. You'll see the list of possible co-riders for that day at your mentioned time. Invite them for a ride or accept their invitations. Person who came was different from the picture on their Quick ride profile! What should I do? Please report the issue at support@quickride.in We are very strict when it comes to imposters. Necessary action will be taken against them. How can I customize my route? After entering to and from location details, you can go to edit route. Google suggested route and other pre-defined alternate routes are shown. Tap any of the pre-defined routes. Tap at a point through which you want to travel. Google wish show the path to your destination through the point you have mentioned. Join existing ride after saving. If I am offering a ride, should I go to ride taker’s home/area to pick them up? Based on the route set by the rider, Quick Ride sets the pickup and drop location for the ride seekers. The ride seekers are asked to come to the nearest location of rider’s route and join the ride. Rider doesn’t have to go to the home location of the ride seeker if it does not fall on the specified route. The rider or ride-taker can further customize this before joining the ride. How can I customize the points charged per seat for a ride offered by me? Global level: Change the default value at Settings in offer ride price per KM and save. This value will be considered for all rides shared by the user, unless it is customized at each ride level. Ride level: Just before offering a ride, tap the Settings button at the lower-corner of the app and adjust the value to desired value and then post the ride. This value will be considered for this ride only. I offered a ride to another user for 40 points, but I got only 4 points after the ride. Why did I not get all the points? This situation might arise when the ride seeker forgets to check in to your ride. If the ride gets complete without the ride seeker checking in, then the ride seekers ride is automatically cancelled. To avoid such situation, make sure that the ride seeker checks in after getting in to the vehicle. What can I do with the points earned by offering rides to others? The points earned can be used to encash for a petro-card that will be issued to you after the 1st encashment. The points can be encashed in My Wallet section by entering the number of points to be encashed. The 1st encash request will take 7-10 days to process. You will be issued a petro-card and it will be delivered to you at your address after confirmation. All the points will be transferred to this card. Subsequent encashment requests will transfer the points directly to the card. You can use these points to buy fuel at selected petrol stations. What is Quick Ride petro card? How do I get my Petro Card? Once you have sufficient points to encash (minimum of 100 points for verified users and 500 points for unverified users), you can encash the points for a petro-card. Why am I not able to encash points? If the points you want to encash are bonus points received from Quick Ride. These points can be used only to avail rides. If you do not have sufficient points to encash. A minimum of 100 points for verified users and 500 points for unverified users is required for encashment to be successful. Should I keep my GPS turned on while using Quick Ride? GPS is not necessary always. Its required only when you want to track Live Ride. How are the points calculated for each ride by Quick Ride? Can I share empty seat on my bike using Quick Ride? Yes, you can share the empty seat on your bike using our app, charge for the seat and share the cost in form of points. What can be the per km charge for bike pooling? Quick Ride sets a default of 3 Pts/km for bike pooling, but you can change it within a range of 0-5 Pts/km according to your convenience. If I am trying to offer a bike ride, who has to carry the helmet for the pillion rider? It would be advantageous for the bike owner to take an extra helmet while starting the ride, since the ride seeker/ pillion rider might not take bike rides on both ways every day. How do I inform the pillion rider that I have an extra helmet, so that he doesn't bring one with him? This information can be mentioned along with the bike make in the profile. It will be visible to all ride seekers who want to travel with you. What are the payment options for recharging Quick Ride wallet? You can recharge the wallet using CC/DC/Internet Banking, PayTm, MobiKwik and FreeCharge. Can payment be done through any other mode other than Quick Ride wallet? No, payment can only be done through Quick Ride wallet, no other modes of payments. If the ride is complete and the points are not debited, how do I transfer the points? You can transfer the points to the rider through My Wallet by entering the amount to be transferred along with the Quick Ride registered mobile number. Can I book the ride through phone call? No, you can book only through App. How do I know if someone has invited me for a ride? When someone chooses you as a possible co-rider you will receive an invitation for a ride through the app notification. You can then choose to accept or reject the invitation. How do I send invite to a rider who matches my route and timing? When the match notification pops up, you can tap on the “Invite” button to invite the rider for a ride. I leave my office at different times every day. Will this app work for me? Surely! Why not? This app has been designed keeping in mind today’s corporate lifestyle. It works in real time considering the options at that particular instant. You can ask for a ride whenever you want to travel and also change the time if required. The system will show all possible riders travelling from or towards your destination at the time you have mentioned. You can choose your rider accordingly. How can I coordinate the pickup point with the rider? Sure you can. Select the days and time in which you would want to take a ride. You'll see the list of possible riders for that day at your mentioned time. Invite the rider for a ride or accept their invitations. How do I reserve an extra seat for my friend/family member? After entering to and from location details, you can modify the number of seats you want below “To” address and then post the ride. What is Pre- Check in? Pre-Check in is the procedure in which you can check-in for the ride before it starts. If you regularly commute with a rider and are sure about joining the ride, you can do Pre-Check-in even before getting into ride. At times when we have constraints with data availability on the go, this option is given. Do I have to check in after I join the car for the ride? Yes, you have to check-in after sitting in the vehicle. Not checking in might lead to the cancellation of your ride after a certain period of time and it might cause inconvenience to you and your rider. When/How do I pay the person who offered me a ride? There are no awkward cash transactions in Quick Ride. After a successful ride, points are automatically transferred from the ride taker’s account to the ride provider’s account and a summary of the transaction is shown to both parties. How can I buy more points to avail rides? You can buy more points by recharging your account in the My Wallet section and choosing the mode of recharge, i.e. Net Banking, Paytm, MobiKwik and FreeCharge. Will the rider wait for me at the pickup location if I am not able to reach there on time? It is advisable to start and reach the pickup point before the pickup time mentioned. Since the riders are corporate professionals, it would be indecent to make them wait for a long time and they wouldn’t want to wait for the ride seekers because of their busy schedule. However, a rider might wait for the ride seeker for 1 minute depending on his timing. Do I have to pay any penalty if I cancel the ride? If the ride is cancelled, no penalty is applicable. I want to find only car rides and do not want to see any option of bike riders! What is the payment mechanism in the system? For passenger: You buy these points by recharging your account from the app. You transfer these points to the rider/car owner on completion of a ride as per the per kilometre fixed rate. Whenever you wish to get refund of these points just write to us at support@quickride.in for full refund. For rider: Points are transferred to you by your co-riders at the end of every ride as per the per kilometre fixed rate. You can redeem these points at your nearby petrol pumps using your Quick Ride petro card. You can recharge your account in the My Wallet section and choosing the mode of recharge, i.e. Net Banking, Paytm, MobiKwik and FreeCharge. What is the fee for using Quick Ride? Quick Ride is FREE to register and use. We charge nominal 6% as service charge for each ride for using the technology. Minimum of Re. 1 is deducted as Service Fee. 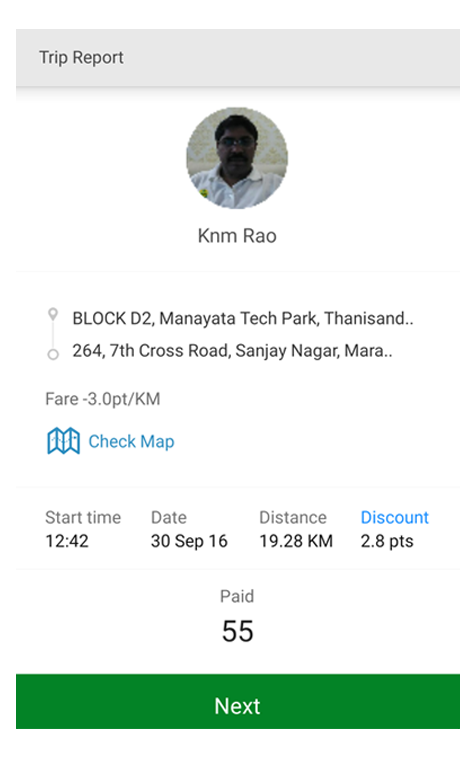 What is the default fare set by Quick Ride? Quick Ride sets a default of 3.5 Pts/km for pooling. However, the amount can be changed within a window of 0-5 Pts/km according to the convenience of the rider. What is the point to rupee conversion? There are no awkward cash transactions in Quick Ride. After a successful ride, points are automatically transferred from the ride taker's account to the ride provider's account and a summary of the transaction is shown to both parties. Default fare set and suggested by Quick Ride is 3.5 points / KM / seat. However, each ride provider can customize this to any value between 0 to 5. Total no of points per seat are then calculated using the following formula: No of points * Distance of the ride requested by the passenger. How much does Quick Ride earn from each ride? For every successful shared ride, Quick Ride deducts 6% of the total points as service fee. If the ride-provider wants to provide free service by setting fare per KM to zero, then Quick Ride will not apply any service charge. Once you have sufficient points to encash (minimum of 100 points for verified users and 500 for unverified users), you can encash the points for a petro-card. It will be delivered to your address after confirmation via phone call. When I encash my points can I get cash or can the money be transferred to my PayTm wallet? You can encash your points through petro card as well as to PayTm wallet. Self declaration is required for PayTm saying that you will be using it for fuel only. What are the types of Petro Card? How to check balance for HP petro card? Call on HP Customer Care no-1800-10-39811, on asking please share the details as follows Customer ID : 2800000323; Control Card No: 2300007696 and mention your card number to know the balance. At Petro Bunk, Swipe the card > choose balance enquiry > enter your pin. You would get to know the balance. How to register the Shell petro card on website? How to sign-up for tmw from Quick Ride App? Go to Redeem section in My wallet, Click on “i” icon. Click on Apply & fill all mandatory details for registration. How do I apply for tmw Prepaid Card? With Registration of your tmw account, prepaid card will be automatically applied and it will sent to you within 7-10 working days. What are the charges to redeem Quick Ride points in tmw? There are no charges to redeem Quick Ride points in tmw. How do I Sign-In & activate my tmw Prepaid Card? Your Card is activated successfully. How much time does it take to card function? Your card is activated instantly and ready to use. Where can I use tmw Prepaid Card? tmw Prepaid Card is accepted at over 2.8mn POS machine across India. You can use it at any Retail Shop, Fuel Station, Restaurant or Hotels & etc. Are there any charges when I swipe tmw Prepaid Card? There are no charges on using tmw prepaid card @ POS machines. Can I withdraw cash using tmw Prepaid Card & are there any charges? Yes, you can withdraw cash from any ATM and Charges will be @ Rs. 24 per withdrawal. Cash withdrawal is only available for Full KYC Customers. How do I get cashback of 0.75% at fuel stations using tmw prepaid card? Your cashback of 0.75% of fuel transaction will be credited to your tmw account in 2-3 working days. How much points is the minimum to redeem to TMW Card? Minimum of 100 Points for verified users and 500 points for unverified users should be in the wallet to redeem it to TMW Card. How can I complete my KYC of my tmw account? Send the duly filled KYC form along with documents (as per guidelines) to our address. We will take 3-4 working days to update your KYC on receipt of KYC. What is the customer care number of tmw? Want to know more on TMW Prepaid Card and TMW Mobile Wallet? Can the Ride Giver charge toll charges from Ride Takers? No, toll charges should not be collected from Ride Taker. It is Ride Giver's own will to post a ride on the toll routes. Which means the fare paid by ride taker is only the fare mentioned for the ride. All users need to verify their phone no for registering with Quick Ride. Quick Ride clearly differentiates the users with Verified status, after validating the Corporate email id. Users can configure their social network profiles, so other users can make informed decisions before connecting. Apart from all the verification, every profile depicts rating given by other riders/ passengers. After every ride we request you to rate and give your feedback, this will help others to choose the ride partner. What if I have travelled with someone once and do not wish to travel with him again? Every time you book for a ride, you can choose the rider you want to travel with. If one of the match is the same rider you had travelled with and do not wish to travel with him again, you can reject the invitation sent by him/her or choose another rider for your travel. Is the system safe for women drivers/ passengers? The system lets you decide who would like to travel with and when. As a woman driver/passenger, you can choose to travel with only women co-rider or person of your choice. You can turn on the same gender option in settings and post rides. How can I report abuse against a fellow member? The system is designed on an 'Accept – Reject' process for every ride. If you are not happy with someone, simply don't ride with them again. You can also rate the member with the feedback. Regular low ratings automatically suspend that user’s account from our database. Also, send us an email with support@quickride.in or call at +918042063302. We take all feedback very seriously and reserve the option to suspend or permanently delete accounts if required. Please report the issue at support@quickride.in. We are very strict when it comes to imposters. Necessary action will be taken against them. I do not want others to view my phone number for personal safety! Ans- You can change the settings so that no one can view your phone number. This can be done in settings by changing “Want to receive calls” option to “No calls, please!”. How does Quick Ride ensure security? Verified users: A Quick Ride user claiming to work for a company is promoted to "Verified" status only if he/she completes verification process on the official email ID provided by that company. Such users can be trusted better than "Not-verified" users. Use caution when you have to travel with "Not-verified" users. We strongly suggest you to set your company name and official email ID in your profile and complete the verification process. This will increase your chances of being accepted as ride partner by others. Users from same company: Quick Ride can be configured to show ride partners from within your company only. To enable this option, go to Settings -> Ride match preferences -> Tick "Same Company" -> Save. After this preference is set, you will be shown only those rides that are posted by Quick Ride users from your company. Similarly, your ride will be shown to your colleagues only. Users from same gender: Quick Ride can be configured to show ride partners belonging to your gender only. To enable this option, go to Settings -> Ride match preferences -> Tick "Same Gender" -> Save. After this preference is set, you will be shown only those rides that are posted by Quick Ride users of same gender. Similarly, your ride will be shown to other users of same gender only. Users with 3 stars and rated 100 times, prefer UserA over other users. See "Do's and Don'ts" in our website for tips on how to get better ratings from other users. In spite of all these, when you meet your ride partner, if you don't feel comfortable sharing the ride, just cancel your ride or unjoin from the ride. There is no obligation to continue against your gut feeling. How can I coordinate the pickup point with the ride seeker/ rider? The live tracking page is displayed on the map. It shows the ride participants/rider and their exact locations at any given point of time. You can use group chat option to chat with all the co-riders and coordinate the location. You can also directly call them on their phone number. After entering to and from location details, you can go to edit route. Google suggested route and other pre-defined alternate routes are shown. Tap any of the pre defined routes. Tap at a point through which you want to travel. Google wish show the path to your destination through the point you have mentioned. Join existing ride after saving. Do I need to take a detour to pick-up the person, whom I will be offering a Ride? Since you're offering the ride it is up to you to decide if you want to deviate from the route and drop the person where they want to be dropped. Coordinate the details in advance to avoid confusion. When a ride seeker finds a ride by entering the location; he/she might get matches with riders who will start the ride much before the pickup location of ride seeker. Route match % shows the ride seeker what percentage of riders route is matching his/her route and vice versa. I do not want to see the rider whose route match percentage is less than 50%! You can change your minimum route match % to 50% under Find Ride option in settings. When you book for a ride after saving, the matches will show you riders whose route match % is more than 50%. Go to Profile -> Edit -> Click on current profile picture (if present) -> The system will give you an option to choose from gallery or click a new picture -> Save. What does different medals stands for in Eco meter? How can I post my queries and problems? You can mail us at support@quickride.in or contact us on 08039515455 to tell us about your issues and ask questions. Can I save my frequently travelled locations so that I do not have to type them again? In "My Favourites" section, you can save your frequently travelled locations so that you do not have to type the location before posting a ride. You will automatically get the option of choosing from your favourite locations to book for a ride. How many referral bonus points will I get , if I refer a person and when? 20 referral bonus points will get credited for both the referrer and referee, when referee completes the first ride with verified profile. Why I didn't get first ride free? If the user is Ride Taker, he/she can take 1st ride free with verified profile. When the user is Ride Giver, then they'll get 50 points on sharing of 1st ride with verified profile. I see a dollar symbol for a user(s) in the matching list, what it means and when I'll get bonus points? Dollar symbol represents a new user in the platform. Share a ride with the new user and you'll get 20 bonus points when the new user provides a 5 star rating to you on completion of the ride.